A new survey of iPhone users indicates that Apple's iCloud service could gain 150 million users, while nearly as many are also interested in using iMessage. Mike Abramsky, analyst with RBC Capital Markets, revealed on Monday the results of a new proprietary survey of 1,500 respondents conducted between June 7 and 14. 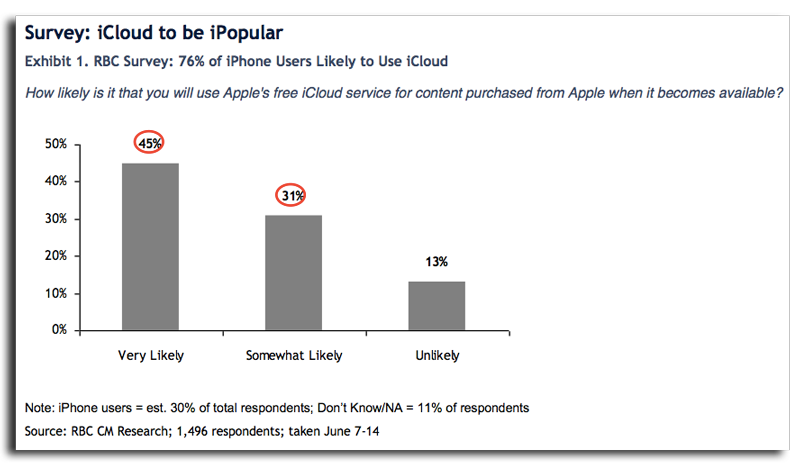 The poll found that 76 percent of iPhone users said they are "very" or "somewhat" likely to use Apple's iCloud service, which would amount to 150 million users. If Apple were to have 150 million iCloud users, it would be competing with services like Google's Gmail, at 200 million users, Yahoo, with 300 million registered users, and Twitter, also at 300 million. iCloud was unveiled earlier this month at Apple's Worldwide Developers Conference. The free service will become available this fall, replacing Apple's existing MobileMe product. The survey also found 73 percent of iPhone users indicated they are "very" or "somewhat" likely to use iMessage, Apple's new proprietary chat service, similar to Research in Motion's BlackBerry Messenger. Abramsky said the results show Apple is likely to enhance the loyalty of existing iPhone users, as well as its 60-million-plus iPod touch users. "Because it stores user data, iCloud, along with iTunes is expected to enhance loyalty and stickiness of Apple's customers, helping defend against threats from Android, helping grow a defensible install base of users who continually upgrade to next generation Macs, iPhones, iPads, and iPods," Abramsky wrote. 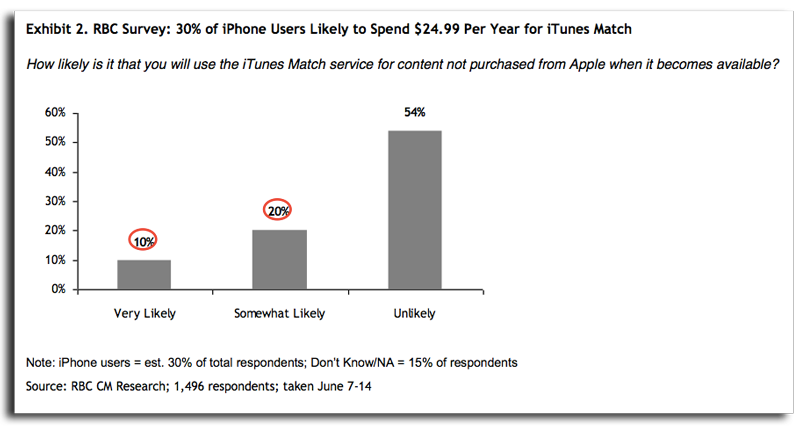 In addition, the survey also found that 30 percent of iPhone users said they are either "very" or "somewhat" likely to spend $24.99 on the new iTunes Match service. Through iTunes Match, Apple will scan a user's library of songs, including those ripped from their own CDs, and match the tracks up with the library of 18 million songs available through iTunes, even upgrading them to high-quality 256Kbps AAC audio files. Abramsky said the survey suggests that Apple could earn a "nominal" $1.5 billion per year in revenue, or 1 percent of annual revenue. Assuming that the gross margins associated with iTunes Match are around 10 percent, which is in line with iTunes content sales, he would also expect the service to have a nominal impact on Apple's earnings per share.